« 1. The surprise was in the colour! 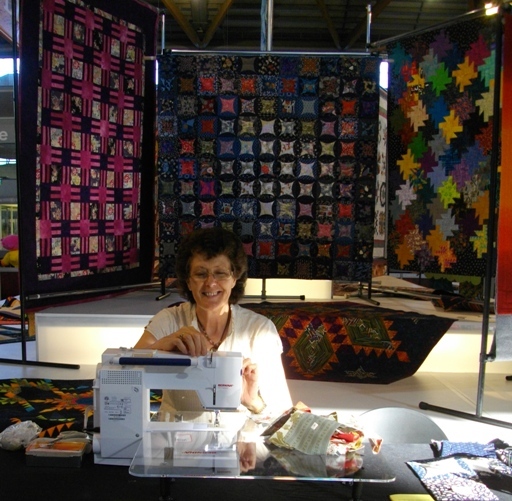 Love your photo with all the patchworks quilts behind you. And I like what you wrote about the quilting ladies and what they do for charity. I’m afraid I am not so charitable. I was famous for my weaving once as well as my Warrior status, wisdom,justice etc and complete lack of humility. My weaving and spinning tale is about a spinner Arachne of whom I was insanely jealous when she nearly beat me in a weaving contest so I tore her work to shreds whereupon Arachne hanged herself. Chastened I then turned her into a spider and condemned her to weave beautiful webs forever. So Beware of some of those quilting ladies if they think your work is too good! Thanks Athena. You are my first visitor/commentor! How exciting . . . it all works : ) AND I will never view those spider webs in my backyard with the same eyes again! Helen, good start on your blog. Looking forward to seeing how you develop and design your blog. I went to the Show last Friday, sorry I missed you there… mind you I wouldn’t have recognised you last Friday! I really like the Arts and Crafts section of the Show… in ’97 I entered and won Second Place for crotcheting a Baby’s Jacket – I used a 1970’s pattern and they loved it! Keep up the great blogging. Interesting Helen, I’m a tapestry weaver, equally as time consuming but less well known art form. Just about to complete an art diploma with tapestry weaving as a major. The work pictured behind you looks lovely. Our group are all writing about such different things! But, it seems some of us have a lot in common – as well as the urge to write! Hi Helen, don’t forget to add ‘Create new blog’ to your list of experiences for 2010. Love the quilts by the way. I have a friend who makes them for her nieces from fabric she collects from the family. Such a lovely idea! Thankyou Hope. I trust you will enjoy my further posts. I have a hoot of a new experience for my next post. Thanks for the encouragement William. I have changed it (as I could read the message in the email) – but where on earth do I find the Moderate button?